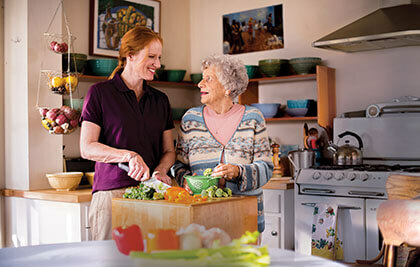 Meal Preparation | Full Circle Home Care Inc.
As your parent ages, he or she may lose interest in food. If your mother or father lives alone, mealtimes may be lonely. If your parent has a reduced sense of taste or smell, food may seem less appetizing. Medications, too, can take a toll on appetite. For aging parents with physical or mental impairments, difficulties with grocery shopping and preparing meals may be obstacles to good nutrition. Even when seniors do eat well, they may not fully absorb all their nutrients. Meanwhile, our nutritional needs change as we age. It all adds up to special needs which can be met through a variety of Full Circle Home Care’s meal services. To ensure your senior parent eats the right foods to stay healthy, Full Circle Home Care caregivers can assist with preparing a well-balanced grocery list. As part of our home care meal service, we can also help your family member clip coupons, find the best deals, monitor on-hand food supplies, dispose of old outdated food and go groceries shopping. Unintentional weight loss affects more than a quarter of people over age 65. It may be a signal that a senior needs home care meals or feeding assistance—all services our caregivers provide. In fact, research shows that feeding assistance, either during or between meals, can improve a senior’s daily fluid and food consumption needed to maintain a healthy weight. Studies show that more than half of all seniors living at home are undernourished or malnourished. An unbalanced diet, the body’s inability to properly absorb food and depression are possible culprits. As part of our home care meal services, our trained caregivers can assist with meal preparation and monitor the food and fluid intake of your senior parent to ensure healthy nutrition. Once a senior parent or disabled family member can no longer cook a nourishing meal for themselves, it won’t be long before their health suffers. As part of our home care meal service, our caregivers can prepare complete, nutritionally balanced breakfasts, lunches and dinners with the right portion sizes for good health.